Feedback and messages from a few of our customers, and some of the more frequently asked questions. Discover and share the passion of wine with an original wine experience gift: Adopt a vine in Alsace, Bordeaux, Burgundy, Languedoc, the Rhone or Loire Valley, wine experience days at the vineyard, welcome gift box, and personalised bottles of wine. Gourmet Odyssey created the adopt-a-vine Wine Experience back in 2009, and since then we have had the pleasure of enabling many people to learn more about wine and the art of wine-making. When we created the concept, our aim was to demystify the world of wine in a very open and practical way, to put our clients in direct contact with our passionate partner winemakers, and to give you the time to discuss and discover what being a winemaker really involves. We’ve had lots of great moments and look forward to many more to come. Here are a few of the messages and feedback that we have received. And you can also take a look at the more frequently asked questions. What a fantastic day. A perfect welcome from Arnaud and Mark, a nice small group, excellent meal, instructive and fun visit, delicious wine tasting and all under a beautiful blue sky. Very many thanks for this day shared together. I think that my husband will remember his 50th birthday gift for a long time to come. We appreciated your simplicity and availability throughout the day. And we met some other lovely people too. In Marseille we also have the same friendly touch that you have. That’s why we were so at ease. We hope to see you again in Marseille or in the vineyard. We were very well received by the winemaker, Marc Plouzeau, and his team. Our time spent in the vineyard, the winery and the chai was very well organised and instructive. We covered everything, from harvesting the grapes to putting them in the vat and tasting the wines. We also met some other lovely people and got to discover the beautiful region in and around Chinon. Nothing more to say other than congratulations for your work and the pleasure that your have been able to produce. A special mention for Louise whose kindness and competence helped contribute significantly to this day that we won’t forget anytime soon! Huge thanks for this great experience day harvesting the grapes. We'll keep the excellent memories of this day for a long time. There was a great atmosphere throughout the day, the winemakers were very kind, and we thank Mark for his gentleness and straight forward approach. It was perfect. Hi! Just to tell you that we collected our wine on Saturday. I have been very impressed by the service of Gourmet Odyssey throughout aand the winery. I will recommend both whenever possible. Thanks for the nice photos and the organisation. I received these adopted vines as a gift and I thought that the idea and visit were very interesting. Domaine de la Guicharde was a discovery and a very enjoyable surprise for me, in terms of their philosophy, the setting, and the quality of the wine which was honestly very good. Marie was very forthcoming and knew how to complement the explanation of Arnaud and Isabelle, notably with regard to the more general aspects of biodynamics. We had an excellent day. A warm welcome from the owners and Marie, a lovely meal, clear explanations of the work involved in the vineyard and how the winery functions. Thank you for sending the photos which capture the excellent day that we spent with you. The welcome, wine tasting, lunch and visit of the winery – everything was perfect. A very informative day in a fun and relaxed atmosphere. The winemaker was very interesting and knew how to share his passion for wine. Through his technical explanations of the work in the vineyard, he enabled us to discover the difficulties that the winemakers face, and how they can use biodynamic methods to help them overcome them and make great wine. Excellent organisation on behalf of Gourmet Odyssey who ensured that this first day will remain unforgettable, and who knew how to lead the winemaker to ensure that his technical explanations remained comprehensible to the neophites that we are, but a little less so now. We let you know how pleased we were at the end of the discovery experience day we spent at Domaine de la Guicharde and we confirm it again! It was very interesting listening to Arnaud explain all the aspects and challenges of wine-making. And for a first day at this winery, it was a great success. In addition, the group was really nice and we had a great time during the meal, meeting some lovely people. What else to add? Apart from that we're looking forward to coming back for the harvest! Not sure which Gourmet Odyssey Wine Experience to choose? To help you select the most suitable Wine Experience for your gift, we've put together a list of the questions that we get asked the most frequently and their answers. We are also available to guide you in your choice or to give you more information over the telephone by calling us on +33 (0)1 46 27 05 92, or by sending us a message through our contact form. Which winery should I choose? That depends on the person you are giving the gift to. Do they prefer red or white wine or do they have a preference for a particular style? You can choose the winery based on the colour of the wine chosen, the red Wine Experience or white Wine Experience, or you can opt for a favourite region. If you are including one or more Experience Days at the winery, you might want to choose the winery based on its closeness and ease of accessibility to the recipient, but sometimes our clients choose a region that is further away so that the recipient can discover a new region. Whichever winery you choose, they are all organically certified, and the winemakers are passionate and eager to share their know-how with you. Find out more aboute our partner wineries. Which Wine Experience Day is the best to include? You can add one or more of three different types of Experience Days to the package chosen for your gift, either at the time of ordering or at a later date. The Discovery Experience Day is the best day to get an introduction and overall feel to the winery. The majority of the time is spent in the vineyard participating in and learning about the vital work needed to produce the best quality grapes come harvest time. The Harvest Experience Day is the most active of the three days, but each harvester is of course free to pick at their own pace - there's no enforced quota to pick, so each participant picks as little or as many grapes as they want! Once the grapes have been picked, the participants follow their journey into the vat and learn about the first stages of fermentation. The Vinification Experience Day is the most technical of the days, picking up after the harvest, and explaining the work in the cellar to vinify, age and blend the wines before the wine is finally ready to be bottled. There is lots of tasting of wines that are still in the ageing process, and this day is enjoyed by even the most knowledgeable wine enthusiast, as it is an opportunity that is only very rarely accessible. What does a typical Experience Day involve? Each Experience Day lasts a full day from 9:30 to 16:00, the time necessary to fully immerse your recipient in the life of a winemaker. You'll spend the day with the winemaker and other key members of their team, and whichever day you are participating in, there will always being something practical to get involved with, whether it be pruning or de-budding the vines, harvesting the grapes, or tasting the wines in the cellar. Each day is valid for two people, and a sit-down lunch and wine tasting are also included in the price. For more in depth information read some of the feedback from our clients and write-ups from the days that have been posted onto our blog. Well we like the wines! But more seriously, the quality of the wine is one of the most important of our selection criteria. Each of the wineries chosen regularly produce wine that are featured in the leading wine guides and reviews, and they often produce award-winning wines. We have a long list of criteria, but the other most important factors in selecting our partners are that they are all organically certified and the winemakers themselves are chosen for the passion they enthuse for their profession. Since creating our adopt-a-vine wine experience in 2009, we have met many recipients of the Wine Experience, and the vast majority have been delighted with their gift, particularly for the originality of the experience and the opportunity to meet and discuss with the winemakers. Many of our clients come to us having had the Wine Experience recommended to them by someone close. You can find a selection of customer feedback on our site. What are the delivery options for the welcome pack ? Orders received Monday to Friday before 14:00 Paris time are prepared and sent by the post on the same day. Orders received during the weekend are sent on the following Monday. Standard delivery times using Colissimo are 2 working days for France and 2-6 working days for the rest of Europe. Express delivery times using Chronopost are 1 day for France and 2 days for the rest of Europe. More information on deliveries. Can you gift wrap the welcome pack? Yes. There is a gift wrapping option available when you place an order. There is a small additional charge of € 5 as gift wrapping is done by hand. We also attach a card using a wax seal, which we can either print with your personalised message or leave blank so that you can add a hand-written message when you receive the welcome pack. 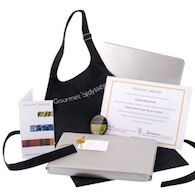 The welcome pack contains a wine cooler bag, a DropStop, a Vinolok re-usable glass wine bottle top, a personalised vine adoption certificate, a brochure explaining their Wine Experience, and an access code to their Customer Portal. Can the recipient change their Wine Experience? Yes. All of our Wine Experiences can be changed to best suit the desires of the recipient. The winery can be changed, or the days can be changed. All you or the recipient need to do is contact us. If there is a difference in price, we'll ask for the additional amount or refund the difference. You or the recipient can also add extra days or extra bottles of wine to the package too. We had a fantastic time. The weather was perfect and it was a great day. Thanks to everyone at the winery for the time they devoted to us and the quality of the experience. We enjoyed the very instructive games and the comparative wine tasting sessions. Very enlightening. It was also good to visit the fermentation hall and see all of the equipment that is involved. You don't often think about all of the work that has been done when a bottle of wine arrives on the table! Thanks to "Father Christmas 2016" for letting me discover your concept, and now that I no longer believe in Father Christmas, I think I'll look to do the experience again in another region. Good luck for the future. A Fantastic day in Saint-Emilion! Thanks to Mark from Gourmet Odyssey for his kindness and for enabling us to discover the excellent Chateau Coutet! Many thanks to Alain for opening the doors to his chateau and sharing his passion for wine during this vinification day. The winery has an old family history, and makes wine respecting the traditions and the surrounding environment. Thanks also to Juliette for her welcome and professionalism. Having returned from our weekend in Chablis, we wanted to thank you, as well as Odile and Jean-Louis for this very enjoyable day at the winery. We had a great time with you. Thank you also for the very tasty winemaker’s lunch and for the overall organisation and good atmosphere of the day! We’re already looking forward to coming back in the autumn to pick up the bottle from our vines, with whom we were delighted to have been introduced! We’re now back from our weekend in Bordeaux and our experience at Château Coutet which was quite simply amazing. On behalf of all our little group who participated in this discovery day, I would like to send you our huge thanks! Everything was perfect, the day, the winery, the meal, and what a tasting! We spent a very enjoyable day learning about wine-making. The atmosphere was great, and the welcome by Mark and the winemakers was very good. After a warm welcome with coffee and croissants, we followed the tractor to the vineyard where we were to harvest, in the middle of the countryside, far from the roads and buildings. It was a real delight, and what's more the weather was great. Marc explained everything before giving us each a basket and a pair of secateurs. Then we split up two per row, and four porters. Explanations, advice, answers to questions - we had two people there just for us, and it was very enjoyable. Back at the winery, we helped unload the trailer and separate the grapes from the stalks. After the apéritif, we sat down to a fine table to appreciate the home-made dishes. And finally, we returned to the chai for the clear and passionate explanations from Marc. It was our first experience of this type of day, and ... what a great discovery! It was intense and enlightening, with very nice people who were happy to be totally immersed as we were ourselves. The winemakers and organisers are dedicated professionals who are passionate about what they do. First and foremost I would like to thank you for such a lovely day on Saturday. It was a pleasure to meet you and be with everyone involved. the experience of being in the fields/vineyards with the wonderful atmosphere and views is something that will stay with me forever. The passion that everyone had was evident throughout the day and to be honest I cant think of anything I would suggest that might improve the experience for anyone else in the future. Thanks again for a lovely day, I am looking forward to visiting again oneday to pick up my wine from my vines! It was extremely informative, set in great surroundings with weather to match. This was our favourite of the three days. The presentation in the cellar was very interesting, clear and passionate. The workshop on the aromas was a great way to prepare for the tasting (maybe you could include this in each of the days! ), and the blending a great discovery! We'll preciously keep fond memories of this excellent day. The weather was with us and the group was very nice. Marc and Louise's explanations were very full and interesting. And what made it even better was to have the opportunity to participate in working in the vineyard. We enjoyed the good organic wines from the winery and the well balanced lunch. To spend the day in the middle of nature, amongst the vines, fields of sunflowers and other crops made it a very relaxing day. So thanks once again. We'll be sure to spread the word! The discovery day last Saturday was a great moment. The sun was out and the participants from far and wide were very nice. A very warm welcome from Mark in a magnificent setting, the winery being located in the middle of the vines. We learnt much from Anne-Laure and Arnaud, but for us, there is still lots to learn. We had a superb day with you last Saturday at Domaine Jean-Marc Brocard. We simply loved it and we have great memories of the day! The organisation and programme were impeccable. We really appreciated the warmth of the welcome and the good atmosphere. The wine tasting and lunch were also very good. And thanks for the adapted meat-free meal! And to finish, a special mention for Mark who knows how to put everyone at ease and who is very welcoming. The organisation was perfect and the day was very interesting. We were enthralled by the explanations of the work in the vineyard. In the fermentation hall, it was a little difficult to hear the explanations because there was another group with a guide who spoke very loudly. But overall we really enjoyed the day. We won't hesitate to recommend you to our friends. A little late, but here are my brief comments on the day: Awesome. It's a little late in getting back to you, but we wanted to let you know that we had a fantastic day! We discovered lots about wine and the region, and met some charming people. It's a region that we didn't know, which is why I chose it, and we loved it. We were very weclome everywhere that we went, and the Stentz-Buecher family in particular are very nice. We spent a very enjoyable day last Sunday. The presentation of the winery was very interesting and the explanation on barrel making and their role in ageing wine, something that is often overlooked, made it a very original approach. The workshop to blend the different grape varietals clearly demonstrated the importance of this step in producing a quality end product. We spent a very good day discovering the hard work that goes into making wine. Everything was perfect. Thanks to the teams at Château Beau Rivage and Gourmet Odyssey. Excellent day. We liked how the day was organised with the different exercises. The ambiance was also very good. We’ll fondly remember this very pleasant day. A fun day where you learn lots. We had a great time in Mark & Christine's company. To do again and to be recommended. A fantastic day that was interesting and fun on all fronts. To do again. Many thanks. I had a great visit and even if I only remember about 10%, it's enough because your were very professional, kind and interesting. I look forward to visiting again. My wife and I were delighted with the Discovery day at Domaine Chapelle on the 12th March. Everything came together to make it such a success. The competence and availability of the winemakers who are very passionate about their job, without forgetting Myriam, the weather, the setting, etc. At the end of the day, we felt that we had a better understanding of the difficulty and skill of working in the vineyard, which is so important in arriving at a quality product. No doubt the memories and knowledge acquired during the day will be remembered during our future wine tastings. Thanks for the photos which capture the fun and spirit of the day spent at the winery. We had a very very good day with you. We can't wait for the next one. Great ambiance, very interesting and enrichening. We are really happy to have participated in this very elightening day on all fronts. We discovered a great winery, learnt about wine-making, and shared some life expériences! The weather was with us and we had a great laugh too. We had a very good day and the sun was shining too, which made the day even more enjoyable. A full and well organised day. I wanted to let you know how much we enjoyed participating in the day on the 25th June at Domaine La Cabotte. A great welcome and organisation, friendly atmosphere, excellent meal, original and passionate wine makers, and very good wine. A great experience and we live in the middle of vineyards. I was delighted with the gift box that I gave to my husband. The Vinification day including the meal with the winemaker, visit of the cellar, and walk in the vineyard etc was perfect, and we await our bottles of personalised wine which should arrive soon. I wanted to thank you and congratulate you for the organisation and your customer care. I also share my good experience with those around me. A very good day. A very nice team of harvesters. The lunch allowed us to ask a whole host of questions to Marc. Thank you for this very instructive day, and I think that we'll have to come back for the vinification day to follow the progress of our little grapes. My adventure at Château de la Bonnelière and the discovery of their wines for my 60th birthday was rich and superb. I can't wait until for the delivery of my special "sixties" vintage to share with my sons who gave me this very original gift. Andrew and I were delighted to get to know you and Marc Plouzeau during our experience days at Château de la Bonnelière. We spent a couple of very warm and friendly days in your company. Richard and I are both wine lovers. Ever since we got together, we’ve covered quite a few of the wine routes, seeking out good wines directly from the producers. But until we received the Gourmet Odyssey wine gift box, we’d never had the opportunity to dig deeper and discover the vast and varied work of a winemaker. It really is a fascinating profession. When we got married, a group of friends clubbed together to buy us a Gourmet Odyssey Wine Experience for our wedding present. For the year of our wedding, we were to become the adoptive parents of 6 vines in France’s Rhone Valley at Domaine la Cabotte. We found it to be a great idea for a wedding gift. We registered our gift pack on Gourmet Odyssey’s web site, and we started to follow the making of our wine. The winemakers sent us news about the vines progress, as the grapes for our future wine grew and matured. When the winemakers starting talking about the harvest, we thought that it would be fun to get involved, so we signed up for a Harvest Experience Day at the winery. What a great day we had! We spent the morning harvesting the grapes, and in the afternoon we helped sort the grapes and put them into the vats. We spent the whole day with the winemakers, Eric & Marie –Pierre, and had the chance to ask them lots of questions, particularly during lunch and the wine-tasting session. We continue to receive updates about how the wine is evolving in the cellar. We decided to add a few extra bottles of personalised wine to surprise our friends and open them with them for our wedding anniversary. We can’t wait to taste the wine from the year of our wedding! A very very enlightening day for lovers of vines, nature and organic farming. My husband Jacques and my son Guillaume share the same love of wine. This year they are both celebrating milestone birthdays – my husband, his 60th birthday, and our son, his 30th birthday. To mark these special occasions, I wanted to give an original wine-related present, which would enable them to share some good times together. I chose Gourmet Odyssey not just for creating their own personalised bottles of wine from the year of their special birthdays, but also so that they can follow the making of their wine from beginning to end, and for the chance to visit the winery, meet the winemaker, and learn about winemaking by getting involved in the work. Jacques loves elegant red wines, so I gave him a vintage from Domaine Chapelle in Burgundy, and for Guillaume, who prefers white wine, I adopted some vines for him at Domaine Stentz-Buecher in Alsace. Each will have their own bottles of wine that they can let the other taste. And as each day at the winery is valid for two people, I chose a Harvest Experience Day at Domaine Stentz-Buecher so that they can pick the grapes from Guillaume’s vines, and a Vinification Experience Day at Domaine Chapelle so they can discover the secrets of the work in the cellar. They were both thrilled with the present, and I’m hoping that it will be a gift that they will remember for a long time to come.